Lost & Found Volume 2 is a Beat-em-up game, published by Oldergames.com, which was released unlicensed in 2007 for the Sega Saturn. Today, I will post a story about the 2nd volume of Lost & Found, released by Oldergames. I've preordered the disc myself at June, and recieved it at the beginning of August. After not getting much feedback from Bivins, I've decided that it is about time I let people know what's wrong with this release. Lost & Found 2 consists of 2 CDR discs, packed into one DVD case, complete with printed covers and CD labels - but no manual. The first disc is an early version of an FMV game titled "Rebellion", but this is the very same disc they released in Lost & Found 1, back in 2004. It isn't really playable, unfortunately. The second disc is what they call "early development stages of Three Dirty Dwarves". After testing this latter game, I have noticed that it really doesn't feel like an early, incomplete game. I didn't notice any missing features, or any differences that could imply that this is an early version of the game. So, I took the USA release of the game, which I own, and began comparing the two discs. I've done comparisons of the files on the discs, as well as ripping both discs to cd images and comparing the two in a hexadecimal editor. Do you want to guess the results? The two discs are completely identical! The Lost & Found release of Three Dirty Dwarves is most definitely NOT an "early developemen version of Three Dirty Dwarves". I contacted RW Bivins from Oldergames.com to let him know of my findings. I only got a few short answers, and some of my questions were completely ignored. But, I thought I'd give him a few day/weeks so he can test this for himself. Some time later he contacted me, saying that they decided to offer the games Weird World 1 and 2 for download, to anybody who purchased L&F2. What is Weird World you ask? Games for the Commodore 64. At the time I'm writing this, Oldergames did not mention their mistake, nor did they contacted the buyers of L&F2 about it (which wouldn't be hard, as there are only about 50 people, and they have their email addresses for sure since they used it to ask the buyers wether they want their purchase shipped before, or after the CGE2K7 event). So, what did you get if you bought Lost & Found 2? Lost & Found 2 costs 30 USD, and offers absolutely nothing interesting, unless you didn't already have Lost & Found 1. Talk about ripoff! 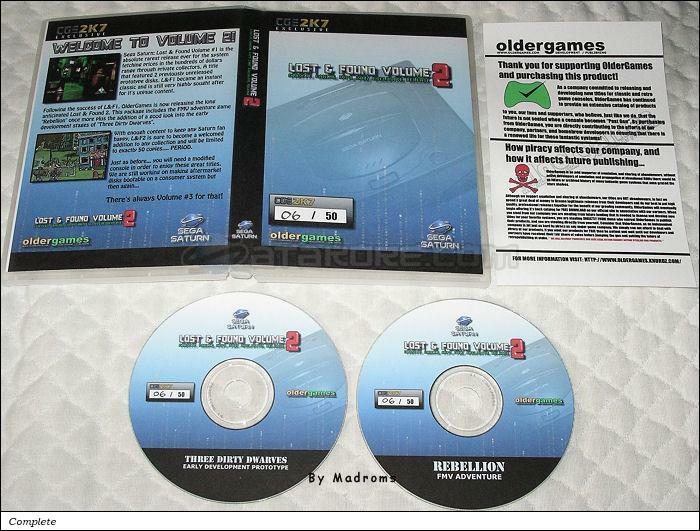 2) Oldergames knew nothing about this before I told them, they have been shafted with a pirate copy marked as a prototype. I'll let you pick the more likely one, hopefully Oldergames will be kind enough to share more information on this. - On how many discs do their copy of Deep Fear come on? The retail game takes 2 discs, if their release is one disc only, you will not get the complete game. - Oldergames may use my SRP utility (found here: http://madroms.free.fr/#SRP) to scan their Deep Fear disc(s), make a full export, and send it to me so I can compare it with the European release. - They can also make some sfv/par2/md5 of the game files so I can compare them to the contents of the European discs. I hope Oldergames just made a mistake without knowing the truth about Three Dirty Dwarves, and that they will continue to provide good Saturn releases in the future. But for now, they probably need to regain the confidence of their costumers.